Chris Massoglia wears black high top Converse “Chuck Taylor” All Stars in the film. Darren Shan contemplates eternal life as a vampire in Cirque du Freak. It seems nearly every couple of months or so, a new film based on a hit YA (young adult) novel comes out. Whether it’s the fourth Hunger Games, Divergent-something, or the latest offering The 5th Wave, adapting a hit tween novel seems to be the new guaranteed cash cow in Hollywood. Before that trend, adapting a young adult novel wasn’t as common and done with much more careful consideration. Cirque Du Freak was a 12-part vampire fiction series centered around Darren Shan, a teenager who became a vampire after visiting an illegal freak. 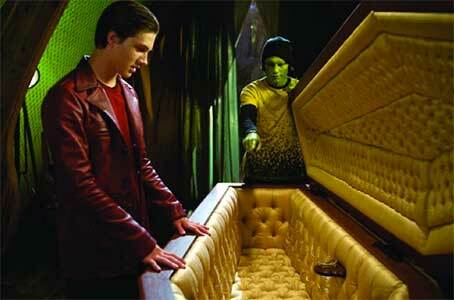 In 2009, the first book was adopted into a feature film Cirque Du Freak: The Vampire’s Assistant. Not surprisingly enough, the adaptation failed to live up to the success of the book. Darren walking through the vampanese campgrounds. Following the plot of the first novel, the film follows Darren Shan (Chris Massoglia) and his best friend Steve Leonard (Josh Hutcherson) visiting a freak show that has come to their town. Steve is convinced one of the members of the freak show, Larten Crepsley (John C. Reilly), is a vampire and sneaks backstage to expose him. Steve confronts Crepsley and asks to be turned into a vampire. He refuses, Steve storms off, and Darren unbeknownst to the two steals Crepsley’s prized spider Madam Octa. Steve ends up getting bitten by the spider and Darren must agree to become Crepsley’s assistant. He agrees, is turned into a vampire, and leaves his family and friends behind. After becoming a member of the freak show, Darren is drawn into a strange world and war between two vampire factions. While the story seems straightforward, it’s pretty hard to follow. Events happen at a disjointed pace, and besides the main characters, it’s hard to figure out who the supporting cast are and why they’re important. Some big stars including Willem Dafoe and Selma Hayek show up, but their relevancy to the story is hard to figure out. After Darren becomes a vampire, the story takes a dozen starts and stops, beginning what seems to be one part of the story but switching course into something else. The special effects and monster makeup is well done, giving the “Freak” aspect of the title proper service. Darren faces off with Steve. Further confounding the problem are the lackluster performances by the solid on paper cast. Massoglia and Hutcherson are unlikable as two basically snot nosed teens. Hutcherson’s Steve Leonard is annoying and bratty, while it’s hard to care for the anything-but-charming Darren Shan. Reilly attempts to play the lead vampire with a mix of bravado, Twilight-esque angst, and humor but fails at the attempt. 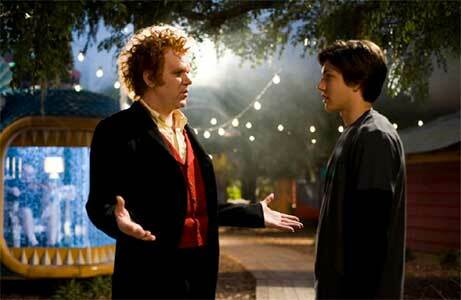 Crepsely ultimate comes off as arrogant and melancholy, which is surprising coming from an actor like Reilly. Darren goes to pick up a clue. Chucks are featured later in the film, with Darren sporting a pair of black high tops. He wears them in later scenes as his conflict with the evil Vampaneze ramps up. Darren falls to the ground. Cirque du Freak: The Vampire’s Assistant (2009) Chris Massoglia, John C. Reilly, Ken Watanabe, Josh Hutcherson, Ray Sevenson, Patrick Fugit, Willem Dafoe, Salma Hayek. Directed by Paul Weitz. Categories: Comedy, Horror.